#Amazon, #Audible: can you get your global act together? I bitched about Audible for not doing a good job of serving the global audience. Well. I just got an email today that reminded me not to forget lambasting Amazon (now audible's parent company). Over 800 Albums for $5 Each..
..from the Amazon mp3 store. Or so it said. It was a lie and grand deception. I so want to buy from Amazon's mp3 store - heaven save me from even considering the Apple iTunes Store - but guess what? I can't. Not authorized outside the US (even though I can buy the exact same thing on a bit of plastic and have it shipped to me). Now, I know it is not Audible and Amazon that set these policies. It's the RIAA and the rest of the old-fashioned publishing industry (be it books or music). And judging by The Washington Post's recent article "E-books spark battle inside the publishing industry", it seems things may get worse before they get better. But I wish Audible and Amazon were a little more aggressive in championing consumer rights. In particular, take close aim at the notion of regional distribution deals. Once upon a time, it was reasonable to ink regional deals. After all, someone needed to provide the warehouse, retail frontage and so on. In far off, foreign lands. But in the digital age, we have global retail frontage. 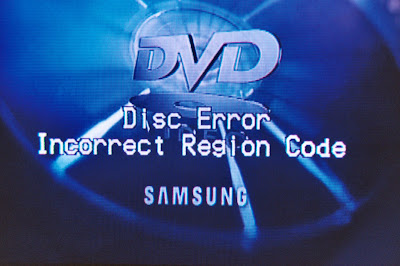 Local distribution deals (and all their attendant evils such as DVD region coding) are an anachronism. To put it simply: When Amazon, Audible or any other internet distributor puts a product in their stores, it should be available (and have been sold on) a global basis. If publishers are not able to make such a deal, don't stock their stuff. Send them packing and tell them to come back when they've got a deal that works for a global audience. But is there an incentive for Amazon, Audible and the like to take such a stand against the publishers? Well here's one: the other 80% of the world market. I loo-ve Audible (props @jason), and Amazon has been a favoured source for years. But if you keep jilting me under the control of US-centric publishers, I'll be the first to jump to a regional/truly-global competitor. Your future growth will be limited to the shores of the continental US.